I Want My Ubuntu TV! CES is upon us, and is no doubt chock full of the usual suspects of consumer electronics OEMs, ODMs, and more. One interesting new attendee this year is Canonical, the folks behind the Ubuntu GNU/Linux distribution. Canonical is making a big push to get Ubuntu onto more than just desktops and laptops, and have been busy building relationships with CE companies to get it onto tablets, phones, and automobile in-vehicle infotainment displays. We’ll see Ubuntu make appearances at several booths to demo this work. Canonical will also be announcing Ubuntu TV. Tablets, phones, IVI systems and Ubuntu TV are a far cry from Ubuntu’s humble beginnings as an easy to use Linux desktop. “Linux for human beings” has always been Ubuntu’s tagline, not “Linux for human being’s portable electronic devices.” So one might be forgiven for asking “WTF, Canonical?” I posed a slightly more polite version of that question to Jane Silber, CEO of Canonical. According to her, CES 2012 will be the first glimpse of an expansion of Ubuntu’s reach across a spectrum of consumer devices. Canonical has a broad multi-screen strategy, and much of their work on the Unity interface to date has been laying the foundation for that strategy. Moreover, the work on Unity is just one example of Canonical’s efforts to move beyond being simply an integrator of components for a functional desktop Linux experience. Their Software Center is another example, as an effort to reward application devlopers. They’ve been working with OEMs to assist in product development. There’s also UbuntuOne, their cloud storage and synchronization service. And Canonical has been working hard to develop touch interface support in the Linux world, as well as driving better ARM support. Ubuntu TV is to be the first proof point of this new strategy. Silber says that you’ll be able to watch your own media files, streaming media, or broadcast media. The goal is to combine all of these media sources without radically changing user behavior. Specifically, Ubuntu TV is not simply a Linux desktop on your TV. Canonical, says Silber, does not believe in the “browser on your TV” experience. “Browsers belong on secondary devices — tablets, phones, etc,” Silber told me. 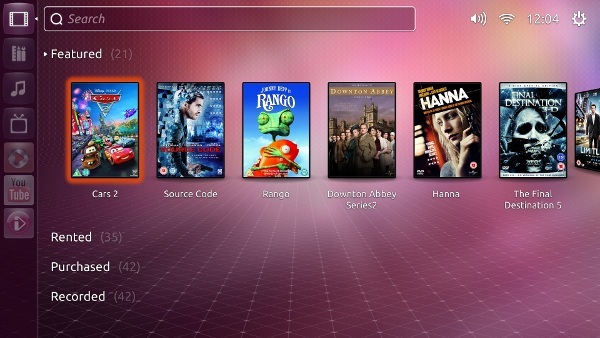 Playing on the Ubuntu tagline, Silber claims Ubuntu TV is “TV for human beings. It just works.” As you can see from the images, Ubuntu TV will have a similar interface to the current Ubuntu desktop, with the launcher on the side, but there will be fundamental differences. The goal is to make Ubuntu TV the “OS for your television”, and not necessarily a set-top box. In that regard, Canonical is working with hardware partners to execute Ubuntu TV. It should be clear at this point that while Canonical has made great strides with it, Ubuntu TV it is not, yet, a finished product. They’ll be demoing working code at CES, but we shouldn’t expect working hardware for a little while yet. I pointed out to Silber that there is a large, vocal body of people who despise the Unity interface, and asked whether it was really a good idea to extend that for media consumption purposes. Silber, like most poeple at Canonical, remained firm that their user testing bore out the merits of Unity. “Judge us by our actions, but also by our results,” she said. As you might recall, the first version of Ubuntu to ship Unity was also the fastest adopted version of Ubuntu. Ubuntu TV will be open source, and we should expect an application development framework from Canonical. I asked Silber about Digital Restrictions Management (DRM), and how Canonical was working with content producers and distributors. 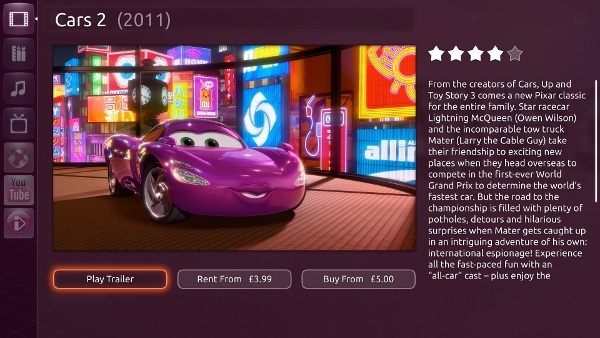 I specifically wanted to know whether Canonical was drawing any lines in the sand with respect to the kinds of content that would be playable on Ubuntu TV. She said that they’re making an effort to reduce the proliferation of DRM, but they recognize that they’re late to this party and have a lot of work ahead of them. Silber acknowledged that Canonical is involved with UltraViolet, stating that “it helps simplify things from our perspective” with respect to encodings and DRM. According to Silber, the biggest hurdle for Ubuntu TV is breaking down all the walled gardens that content producers and rightsholders have erected. Every studio wants you to watch their content on their website, with their widgets, and their advertising — all under their control. Canonical believes that there should be a single, elegant interface for consuming media, regardless of the content source. Silber believes that Canonical and Ubuntu represent a reasonable middle ground as a relatively vendor-neutral solution to this problem. Canonical isn’t in the media production business, nor are they in the hardware manufacturing business: they just want to be the OS for your TV (for now). That notion of “reasonable middle ground” extends beyond just Ubuntu TV. As Canonical pushes to get Ubuntu onto more devices, Silber says that many CE manufacturers are looking for a third option to the iOS / Android hegemony. Again Silber admits that Canonical is late to this game, but this does allow them to learn from the mistakes of the trailblazers, as well as to identify under-served markets. Device manufacturers want a platform for innovation that supports post-sale service revenues in ways that Apple and Google aren’t satisfying. They’re also increasingly aware that upgrades are fundamentally important to the successful longevity of their products. Canonical, according to Silber, is a smaller, easier to work with partner that has a proven rhythm for releasing major updates. While Ubuntu TV is still a developing product, it’s a positive sign of things to come from Canonical. Silber assured me that we should expect additional news throughout the year that demonstrates the viability of Ubuntu as a platform across multiple consumer devices. With UbuntuOne as a data synchronization service to connect Ubuntu-powered devices, I think we can expect interesting things in the way of converged user experiences from Canonical in 2012.